Abdulaziz ibn Saud  (15 January 1876  – 9 November 1953), was the founder and first monarch of Saudi Arabia. He was usually known in the Arab world as Abdulaziz  and known outside it as Ibn Saud. He reconquered his family's ancestral home city of Riyadh in 1902. This started 30 years which made him the ruler of nearly all of central Arabia. He consolidated his control over the Najd in 1922, then conquered the Hijaz in 1925. He united his dominions into the Kingdom of Saudi Arabia in 1932. 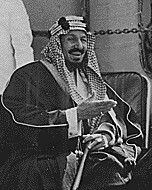 As King, he presided over the discovery of petroleum in Saudi Arabia in 1938 and the beginning of large-scale oil production after World War II. He fathered many children, including 45 sons. He died of a heart attack. All the later kings of Saudi Arabia have been his children. ↑ His birthday is generally accepted as 1876, although a few sources give it as 1880. According to British author Robert Lacey's book The Kingdom, a leading Saudi historian found records that show Ibn Saud in 1891 greeting an important tribal delegation. The historian reasoned that a nine or ten-year-old child (as given by the 1880 birth date) would have been too young to be allowed to greet such a delegation, while an adolescent of 14 or 15 (as given by the 1876 date) would likely have been allowed. When Lacey interviewed one of Ibn Saud's sons before writing the book, the son recalled that his father often laughed at records showing his birth date to be 1880. Ibn Saud's response to such records was told as "I swallowed four years of my life". ↑ Lacey, Robert (1982). The Kingdom. New York: Harcourt Brace Jovanovich. ISBN 0-15-147260-2. ↑ Ibn Saud, meaning son of Saud, was a sort of title borne by previous heads of the House of Saud, similar to a Scottish clan chief's title of "the MacGregor" or "the MacDougall". When used without comment it refers solely to Abdul-Aziz, although prior to the capture of Riyadh in 1902 it referred to his father, Abdul Rahman (Lacey 1982, pp. 15, 65). ↑ "King Abdul Aziz family tree". Geocities. Retrieved 23 August 2013. This page was last changed on 13 September 2018, at 08:00.